There is no finer or more enjoyable and relaxing way to celebrate your Easter holiday than in the cozy and elegant splendor of the Hampshire House. Located on historic Beacon Street in Boston, with a stellar view of the Victorian style Boston Public Garden, it is the perfect setting to enjoy a fine spring day while you partake in a gourmet Easter Brunch to envelope the senses, overseen by our President and CEO, Chef Markus Ripperger. His menu selections merge the very best of his European pedigree with classic New England cuisine. There are traditional favorites such as clam chowder, smoked salmon benedict, grilled lamb chops, and lobster omelet, in addition to wholesome choices for our more health-conscious guests. All our expertly crafted dishes are enhanced with seasonal vegetables such as asparagus, sweet peas, snap peas and fava beans. 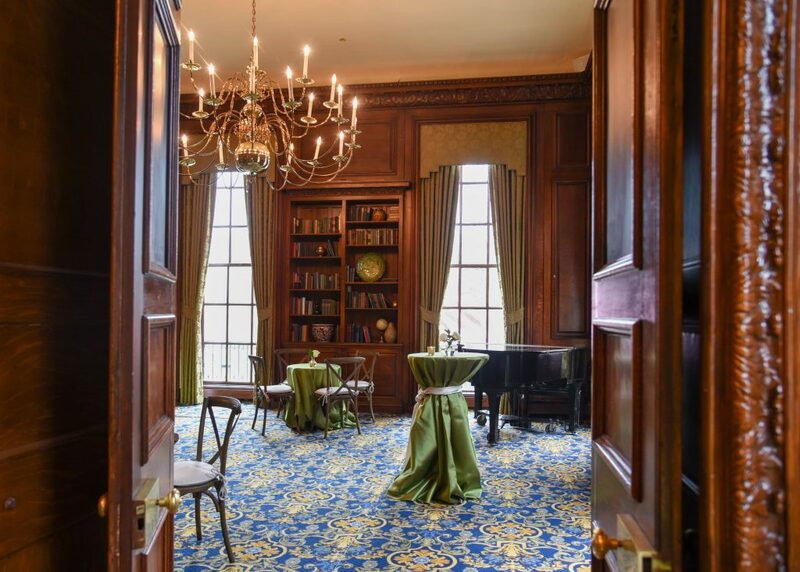 While you enjoy our exquisite cuisine, relax in our turn-of-the-century Georgian revival townhouse, where generations of Boston’s elite dined in grand style. The mansion is lavishly appointed with carved oak paneling, Italian marble, Palladian windows, and crystal chandeliers — it’s the height of elegance, yet with cozy New England appeal. To begin your Easter Brunch, you can choose from classic favorites such as traditional New England style clam chowder and Maine lobster bisque. Our refreshing spring salad features seasonal vegetables such as baby arugula, fava beans, asparagus, and sugar snap peas, with dried apricots, almonds, and lemon vinaigrette. There’s a fresh fruit medley of seasonal fruit and berries, as well as our gulf shrimp martini with crisp vegetable spaghetti and tomato olive relish. For your main dish, we offer traditional eggs benedict with maple cured Canadian bacon, smoked salmon benedict, or Florentine benedict with sautéed spinach. Our benedicts are made the classic way, with a fine herb hollandaise sauce and served on an English muffin. Other breakfast selections include the Healthy Librarian (an Egg Beater® omelet with spring vegetables), New England lobster omelet, and stuffed French toast with cream cheese, raspberry preserve, and fresh berries. For meat lovers, we recommend our grilled beef tenderloin medallions or wood-grilled lamb chops with black olive tapenade. We also have char-grilled chicken pasta and herb-crusted salmon with spring vegetables, couscous, and mint mustard vinaigrette. Chocolate lovers will delight in our ultra-special dessert — a tantalizing trilogy of swiss chocolate maple soup, chocolate mousse tartlet, and bittersweet chocolate crème brûlée. The Hampshire House Easter Brunch is served on Sunday, April 21, 2019, from 11 a.m. to 2 p.m. For further details, download our Easter Brunch menu or call us at 617-227-9600. You can make a reservation online. Our Easter Brunch is extremely popular, so we highly recommend that you make your reservation today!